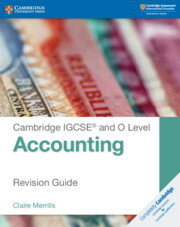 With more practice questions than the previous edition and content matched to the Cambridge IGCSE and O Level Accounting syllabuses, this coursebook increases understanding of accounting best practice. Clear step-by-step explanations and instructions help students learn how to record, report, present and interpret financial information while gaining an appreciation of the ways accounting is used in modern business contexts. 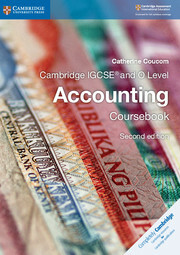 The coursebook is ideal for those new to accounting. 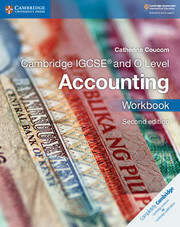 Also available in the series - workbook, revision guide, teacher's resource and Cambridge Elevate enhanced edition. 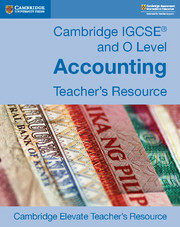 Answers to the coursebook and workbook questions are in the teacher's resource. 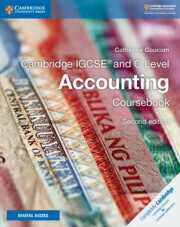 A range of new practice exercises builds students' accounting skills and confidence with the subject. Walkthroughs illustrate key accounting principles with absolute clarity. Test yourself questions reinforce learning and aid self-assessment. Revision checklists provide a quick summary of the key points covered in a chapter to consolidate learning.